Search for all "Beta-galactosidase tag"
Rabbit anti Escherichia coli Beta-galactosidase tag. 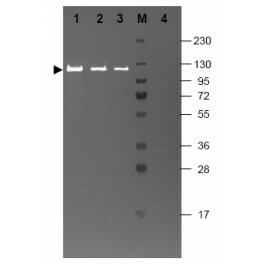 Product is tested for Paraffin Sections, Frozen Sections, Enzyme Immunoassay, Western blot / Immunoblot. Suitable for Immunoblotting (Western or Dot blot), ELISA, Immunoprecipitation and most immunological methods requiring high titer and specificity. Beta-galactosidase is coded by a gene (lac z) in the lac operon of Escherichia coli. It is a metalloenzyme that splits lactose into glucose and galactose. It hydrolyzes terminal, non-reducing beta-D-galactose residues in beta-D-galactosides. Activation by cations seems to be substrate dependent. K+, Na+, NH4+, Rb+, Cs+ and Mn++ all activate enzyme activity based upon the substrate used. Store vial at 2-8°C prior to restoration. Centrifuge product if not completely clear after standing at room temperature. This product is stable for one month at 2-8°C as an undiluted liquid. For extended storage aliquot contents and freeze at -20°C or below. Avoid cycles of freezing and thawing. Purified from monospecific antiserum by Delipidation and Defribination. Restore with 2.0 ml of deionized water (or equivalent). 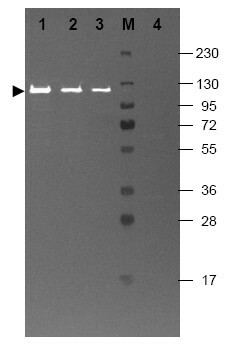 Assay by immunoelectrophoresis resulted in a single precipitin arc against purified and partially purified Beta Galactosidase [E. coli]. Cross reactivity against Beta Galactosidase from other sources may occur but have not been specifically determined.